Science has proven that peptides can help manage wrinkles in your skin and reverse the signs of aging. So how do peptides in skin care products make your skin look younger? Human skin is comprised mostly of collagen. Collagen is a protein comprised of long segments of amino acids arranged like a chain. When collagen breaks down, short segments of amino acids are formed. These are the tiny proteins and active molecules known as peptides. Peptides in skin care can provide significant anti-aging benefits. When collagen is depleted by age and environmental factors, including sunlight, it is not fully replaced. As a result, smooth, young skin slowly becomes thinner and wrinkled over time. As collagen deteriorates, it produces certain peptides. 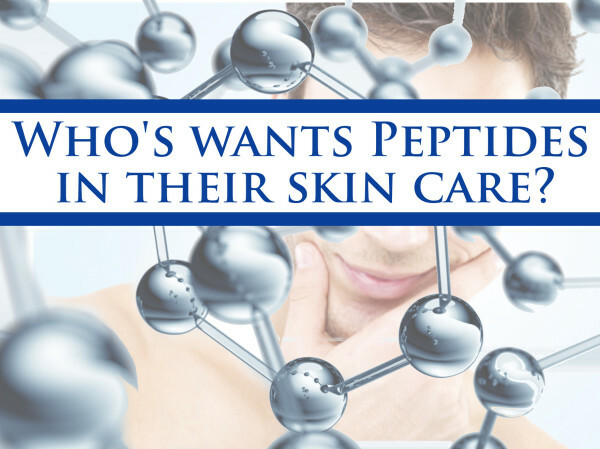 Research from the National Institutes of Health (NIH) shows that these peptides send a "message" to your skin that it has lost collagen and needs to generate more. When skin care peptides are applied topically, your skin "thinks" that it's a collagen break down product and that your body needs to manufacture new collagen. So you can successfully minimise wrinkles and give your skin a more youthful appearance with the application of skin care peptides that trigger the production of collagen. Think of it like this. Imagine a builder is building a house with bricks. Imagine there are 3 men making the concrete (the peptides) that holds the bricks together and only one man to stack the bricks (the collagen). Obviously there is going to be an abundance of concrete and not enough bricks. In this instance there would be a quick call out to bring more bricks. So it's quite similar to you skin making more collagen and other that make up healthy skin. What’s most important for you to keep in mind is that as special as peptides are, they aren’t enough to address all the needs of skin. Any skincare formula worthy of your hard earned dollars must include the specialised ingredients we talk about all the time such as antioxidants, skin-replenishing ingredients, and skin-restoring ingredients (which includes peptides). Peptides on their own aren’t capable of doing it all if your goal is to achieve long-lasting smooth, soft, hydrated, radiant, firmer-appearing and younger-looking skin. The best news for you today is that we have the proven peptide Heptapeptide-8 in our Nutrient day serum which also includes a whole range of other useful anti-aging ingredients. There's super stable Vitamin C, Hyaluronic Acid, Dragons Blood, Cucumber oil, Quercus Suber Bark extract, Green Tea, Hydrolised Collagen, Kakadu Plum extract and Vitamin E.